Messi Says He Didn't Direct Insult At The Referee, But "At The Air"
“My expressions were never directed to the referee, they were said to the air,” Messi said in the appeal, according to the Argentine newspaper La Nacion. The excuse is a little hard to buy considering Messi seemed to be looking right at the ref when he said the offending words, but it’s entirely possible they spilled out in the heat of the moment after the call, while Messi was still facing the referee. But whether he said it to the referee or to the air, four games, one of which—a 2-0 loss to Bolivia—he has already missed, is an excessive punishment. Messi wasn’t even carded for the blowup at the time—it was only after the match that the incident was brought to FIFA’s attention, by, wait for it, Argentina’s CONMEBOL rival, Chile. Messi has already missed seven of Argentina’s 13 World Cup qualifying matches this cycle due to injury. 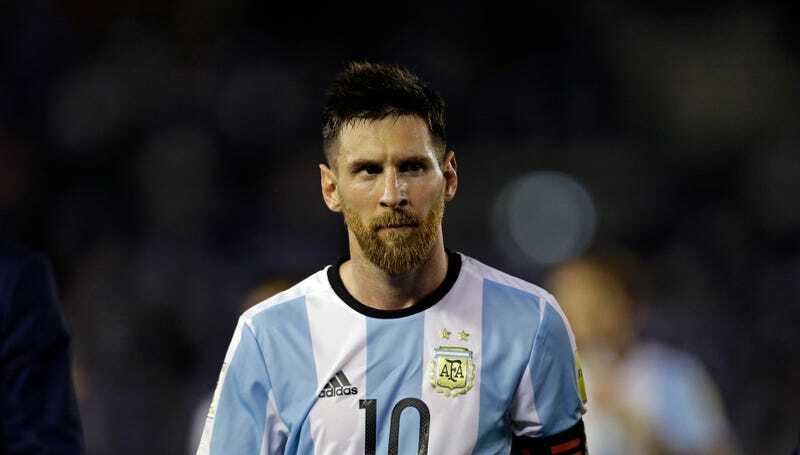 Now, with only four left, Argentina sitting in fifth place in CONMEBOL qualifying, and Messi currently only available for the last qualifier in October, Argentina are on the cusp of not making it to Russia next year. And while Argentina are, at this point, used to playing without Messi, having the world’s best player on the pitch inarguably helps their chances.